Discussion in 'Showroom' started by Pacca, Jan 5, 2018. 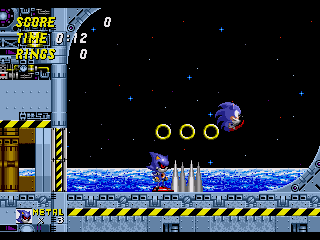 I think that the best course of action is to simply finish all the Sonic 2 zones, then move on to the Sonic 1 zones once Sonic 2 is completed. That way, they won't drag out an initial full release, but still could potentially be added at a later date. If anyone has any ideas for fixing the spin tube glitches, I'd love to hear them. The object isn't well commented/labelled, and it relies heavily on registers, so I have a hard time figuring out what its' actually doing. Angel X, EMK-20218, ProjectFM and 2 others like this. Angel X, Iso Kilo, HyaDoki and 10 others like this. I know I don't say this often, and while what you've done isn't much in the realms of originality, what I do admire is how well you've progressed, you've learnt so much and you are only proving your programming skills through every screenshot and every video, just every shot is one advantage from the last. vladikcomper, EMK-20218, Natsumi and 3 others like this. Angel X, Renegade, TruffledToad and 8 others like this. Very good work from Pacguy and also Unlimited Trees with his rather unique art work. Regarding the Metal/Sonic fight, do you intend on implementing the Act 1 / Act 2 title card for Death Egg or would you rather roll everything into one act or even fade into the next act without the title card popping up again? The Metal Sonic fight technically occurs in Death Egg Zone Act 2, so modifying the Title cards to display acts would require me to hard code it to display the wrong act numbers just for Death Egg, or swap the acts around, which would require quite a lot of changes to the code. I figured it just wasn't important enough to go through all that. 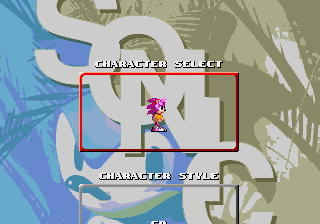 I've yet to figure out how to disable the title card during transitions though (it even appears during time travel, although I made it work out with the Past/Present/Future text at the bottom). I have looked at the code before for the title cards and it wouldn't be that hard to do a card swap I think. Nice bridge badnik by the way. Some really good ideas in this hack, it's quite promising in many ways. A-S-H, Calvin, Renegade and 1 other person like this. Although, it seems like a tad bit of a waste to have mechanic like that limited to only the bad future, so why not implement something similar in the good future? Here's my idea: have the good future start out as normal, but if you pull any of the switches, a gas will come out that super-charges your character! It'll fade after a while, so you'll need to keep going after those switches if you want the boost to last. 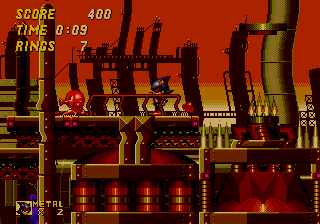 Of course, seeing how Metal Sonic's bad future is his good future and vice-versa, you could swap the mechanics of the two futures when you play as Metal Sonic! All this might seem a little redundant, considering that you can find Time Stones in the futures that can turn you super, but I thought it was worth sharing. Maybe with a bit of creativity you could try and come up with a different idea for what the good future gas does? Perhaps Oil Ocean Good Future could have a gimmick where the switch releases a fertiliser or something that could make a nearby plant grow and open up a new path? Ideas aside, it's looking awesome Pacca! I'm really liking all these cool additions, especially in the options menu. Damn, that thing has a lot of customisation! If I have to say anything, I'd suggest you make the ring draining a little slower, since it seems really fast for me. I'm really looking forward to playing this hack in the SHC this year! Hey Pacca, did some optical observation of the new update, I love it! First off, SMS Alfredo mentioning Metal Sonic makes me think that he should be resistant to the gas, as he is a robot after all, and you have to earn the bad future. Seeing you use custom music gave me an idea, integrating a CD audio playlist. The way this would work is you could include some custom picks for songs in a zip file separate from the hack (In case some people don't want them.) and the playlist file (IIRC Kega needs it.) so people could turn the CD songs. Or if you can't pick, just put in the playlist and let people pick their own songs. 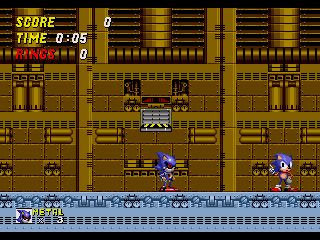 Of course, that's only if the hack has been ported to Sega CD, I don't know it has. Also, not related to any screenshots, but A-S-H. Changing your profile pic so people don't recognise you, you absolute mad lad. Someone better stop you before you get in trouble! Just kidding, awesome picture though. That's certainly a creative idea! I'm not sure how to implement it in a way that would make sense though. First off, SMS Alfredo mentioning Metal Sonic makes me think that he should be resistant to the gas, as he is a robot after all, and your have to earn the bad future. I kind of want to keep the bad future more dangerous, even for Metal who has to unlock it. 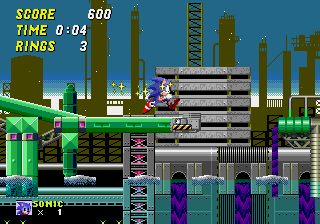 It just makes sense canonically, since they're typically filled with broken machinery and robotnik has been given the opportunity to do whatever he wants with the place. As for Metal taking ring drain, most robots and computers aren't exactly fans of dust and heat! 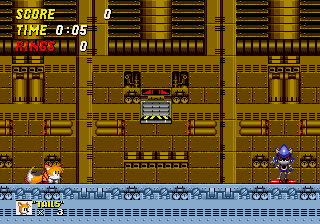 As for the Sega CD stuff, I still can't do anything along those lines right now. Lazlos been really busy and has been unable to get a functional mode 1 example program for me to build off of. Please don't bug them about it, the fact that they offered at all is far more generous then I could have hoped for! Renegade and A-S-H like this. And soap foam in the place of the oil. HyaDoki, A-S-H, StephenUK and 3 others like this. Very well made. Although I don't like the palette changes in the zone's bad (appearantly bad) future. You're really making a very nice job. This hack is looking incredibly unique and beautiful. There's also one of the most funny and interesting credits screen I've ever seen.Its a wonderful job, man. Really wonderful! Keep it up improving, because it's damn great! I like a lot of the things in this update, the Chaotix soundtrack is something I REALLY like. I'm not a fan of the gameplay in Chaotix, but I love the soundtrack. I really like Oil Ocean as a level, and using Volcano Valley's music for it works really well, but I can't help but feel that the fumes come in a tad too quick. 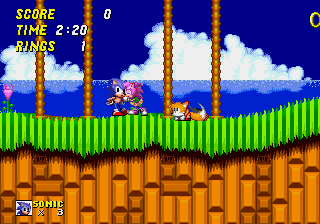 Seeing some of your quick reflexes with Knuckles didn't really help, but I'll let it slide because the feature is cool anyway. Also, I saw my name in the credits (Which are pretty cool by the way.) under object art (Oh yeah, I did that thing that time.) and now I have a massive goofy grin on my face. I really appreciate it. Edit: An idea I had, that construction Badnik could be slightly modified to fit OOZ's Good Future. I think A-S-H had the original idea for plants. I would encourage you to make your own thread just like you did on Retro. If need be we can split the posts in here into the new thread where possible. Pacca, EMK-20218 and TruffledToad like this. I feel really uncomfortable making all these threads without an actual download link, but here goes nothing Feel free to merge all the old posts from the general screenshots thread here. Although nothing truly substantial has been released of this project beyond an extremely old and buggy prototype, I've made several videos showing the project off. I've compiled them all into a playlist, if you want to watch them all in one sitting. Although a completion date is far from settled, a partial demo is planned for the upcoming Sonic Hacking Contest! Eukaryot, maple_t, Iso Kilo and 5 others like this.